Back to school time is a season filled with mixed feelings, excitement over new beginnings, and sadness that summer is almost over. If you are a parent, you have so many things to do to prepare your kids for this new adventure. School supplies, backpacks, uniforms, back to school clothes, tablets, laptops…it all adds up! That’s why we, Alexandru Hardwood Flooring, are offering you the best offer of the year; 15% off any refinishing job with us during the month of September. 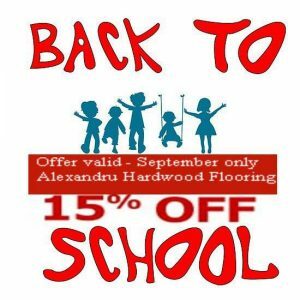 Take advantage of this and refinish your hardwood floors with us while your kids are back in school and you finally have a little bit of “peace and quiet” at home! Sit back and relax watching us make your floors look like new again, or even change the old color to one in trend and give your floors a makeover! Everything it’s possible, with Alexandru Hardwood Flooring, and for less money for a limited time.